In this video I look at felling dead, standing timber for firewood in winter. The felling technique involves the use of both the axe and the saw to create a very controlled cut and fall. Further, axe and saw techniques for sectioning the trunk are demonstrated and discussed. Whether you are hot-tenting or bivouacking with a fire, these skills should be in your winter bushcraft repertoire. Another outstanding video Paul, great timing, i was felling yesterday and will be splitting later today. Its like living in the ice-age in my house, were is SPRING, its warmer in the forest up Scotland. Thanks Duane. Have you got any videos planned/coming out soon? I will try to get more videos done. I really enjoyed putting this one together. They are quite time-consuming for me at the moment though (the editing) but I’m hoping to become more efficient with practice. It would be great to have you along on a course when you can make it. Great video, Paul. The first person camera angles are especially nice for seeing just how you’re cutting. Thanks for the feedback on the first-person angles. They were an experiment. I wasn’t sure how they would go down as they are somewhat shaky compared to the other shots. I tried to combine them in an informative way though. Glad it worked for you. Great video Paul, good visuals and tips, well done and reminds me of the many winters chopping wood for the stove in Ontario with my brother. We used to have competitions to see who could fell a tree to hit a mark – good fun. Hope you enjoy spring and perhaps see you later this year. Good video, very informative. I am going to turn my 12 yr old son on to your site. I have taught him how to use a cross cut with me and he does split would now but I think your video would help him a lot. I have experience in video as well and yes they are very time consuming, however, I think important in todays digital world. Thanks for your feedback. I’m pleased you liked the video. Videos do seem to be the way forward and while they are time-consuming, the end result is pretty satisfying when you feel you’ve done a good job. It sounds like your son is receiving a very solid foundation from you. I hope my video does help him. Thanks for recommending my site. Nice video it reminded me of tuition from my old scout mistress she was seventy plus and could swing an axe better than most men. She always said ” you can tell a good axe man by the size of the wood chips”. I cut tons of Trees in the aftermath of the 87 gales in norfolk, with a chainsaw of course. I learned how to hinge a tree to control the direction of fall if necessary by controlling the horizontal cut to leave material at a greater thickness to the side of the cut where you wanted to swing it. Never assume that a tree will fall as you think though and stay safe. As we know tree felling can be dangerous. Thanks for your comment. It sounds like you had a very good scout mistress. I’d have loved to meet her! “Never assume that a tree will fall as you think though and stay safe.” – very sound advice and always worth re-iterating. Excellent video ! Well done. Great video Paul, nice gob-cut with the axe too. Don’t forget, if you can do a video with the 7items that you don’t leave home without, would be great! I haven’t forgotten about your “7 items” suggestion. It’s definitely on my list. But thanks for reminding me anyway! Good show old boy ! Thanks for making yet another good video. Was it the scandinavian forest axe your using here? And what would you have done if the tree you felled was to heavy to roll over when chopping and sawing it into sections? Thanks for your feedback on the video. It was the Gransfors Bruks Scandinavian Forest Axe that I was using. I rolled the remainder of the tree to get it up out of the snow a bit – all the chopping lower down the trunk had knocked it lower and lower. It was mainly to be a little kinder to my back! 🙂 If I hadn’t been able to move it, I’d have just chopped it where it was. Great Video Paul, well done & great tutorial. I subbed to your YouTube channel. As always, nice to hear from you. Glad you liked the video. I hope your Hultafors is suiting you well? Thanks for the sub too! A great video in a truly stunning location. I might have missed it but I think you needed to mention where you start your back cut in relation to your frog/gob/sink cut made with your axe. I was always told that it should come slightly above your gob cut and, crucially, be horizontal – never at an angle! I hope that, at some point, you will demonstrate felling a tree only using an axe and only using a saw – but that will depend on how much firewood you need, I suppose. Another thing that I was taught is that when you are cutting the felled tree using an axe, you should always try to have your legs slightly in front of the place where you are creating your cut ‘V’; in that way, if you miss hit it or the axe bounces off for some reason, the sharp edge will slice through air, rather than your lower leg. I know that you have the work between you and the axe blade but strange things can happen towards the end of a day when fatigue kicks in. As ever, wonderfully informative and beautifully shot. You really were in a sort of frozen paradise! Many thanks. Thanks for your feedback. The northern forest in winter really is stunning – even more so “in the flesh” than it appears on video too. I did mention to position of the back cut, albeit briefly – watch around 04:15. I do have some more videos in the pipeline, including some of what is on your wish-list. That’s a good point regarding the position of your legs and feet relative to the log. I was taught to do it with the log in front of me but with the work always between me and the axe. The first V is relatively safe as you only come half way through. The second V is less safe, particularly as you break through the last remaining parts and the trunk separates into two. I tend to go a lot more gingerly and/or more vertically at that point. When splitting with this type of swing, however, I always stand in front of the work and I’m fastidious about my foot placement. 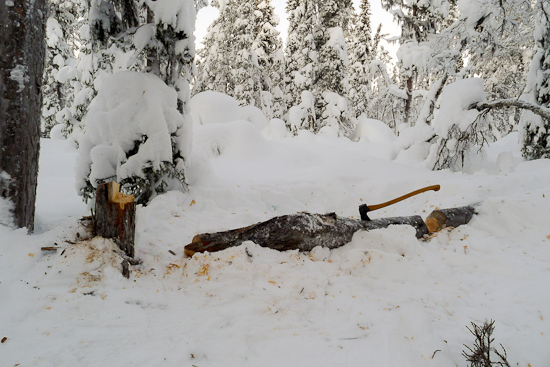 You can see this in another video which is embedded in the following article: How To Split Firewood On Snow: Key Axe Techniques. “strange things can happen towards the end of a day when fatigue kicks in” – indeed! And we should never forget this or get sloppy, even when we are experienced. Wise words. Superb video. Reminds me of the first tree you taught me to cut down ‘properly/safely’- still got the axe, a life long friend ! I also carved a rather large kuuksa from the Birch- now in my ‘shed’ a momento of the occasion. Again a super video/tutorial. The collection grows ! Thanks for your comment – ah the good old days. It seems a while ago but part of the rich tapestry that illustrates our journey down this path. A great video paul with some great tips and tutoriol. The location looks fantastic!!! Glad you like the video and the look of the location. It really is stunning and I wish more people could experience it first hand. I’m sure I was more tired than you just watching it! Hi Paul! First time visitor and will be back for sure. I’m curious as to what type of saw you were using. Great education you are poviding. Carry on brother! Thank You! I’m glad you’ve found my blog (and the great community of people who comment and share their own knowledge and experience). The saw is a folding bucksaw. There is an article on this blog about how to make one here. You can also buy something similar here. Cool video! Good timing and precision. And you use first person camera angle which is also so cool I think. Thanks for sharing this great informative video. Good job Paul! Thanks for the feedback Karen!